Turbulent behavior at sub-proton scales in magnetized plasmas is important for a full understanding of the energetics of astrophysical flows such as the solar wind. We study the formation of electron temperature anisotropy due to reconnection in the turbulent decay of sub-proton scale fluctuations using two dimensional, particle-in-cell (PIC) plasma simulations with realistic electron-proton mass ratio and a guide field out of the simulation plane. A fluctuation power spectrum with approximately power law form is created down to scales of order the electron gyroradius. In the dynamic mag- netic field topology, which gradually relaxes in complexity, we identify the signatures of collisionless reconnection at sites of X-point field geometry. The reconnection sites are generally associated with regions of strong parallel electron temperature anisotropy. The evolving topology of magnetic field lines connected to a reconnection site allows spatial mixing of electrons accelerated at multiple, spatially separated reconnection re- gions. This leads to the formation of multi-peaked velocity distribution functions with a strong parallel temperature anisotropy. In a three-dimensional system, supporting the appropriate wave vectors, the multi-peaked distribution functions would be expected to be unstable to kinetic instabilities, contributing to dissipation. The proposed mecha- nism of anisotropy formation is also relevant to space and astrophysical systems where the evolution of the plasma is constrained by linear temperature anisotropy instability thresholds. The presence of reconnection sites leads to electron energy gain, nonlocal ve- locity space mixing and the formation of strong temperature anisotropy; this is evidence of an important role for reconnection in the dissipation of turbulent fluctuations. Haynes, C.T, Burgess, D, & Camporeale, E. (2014). 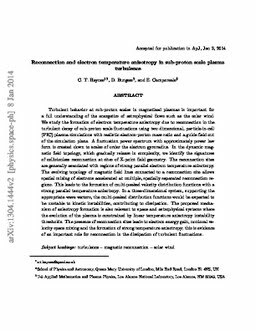 Reconnection and electron temperature anisotropy in sub-proton scale plasma. Astrophysical Journal, 783(38).